What is the Media Center RSS Feed Feature? The Media Center RSS Feed Feature is a great way to bring access to your media in your app if you have an RSS feed! In this article we’ll go over how to set up the Media Center RSS Feed Feature. What are some use cases of the Media Center RSS Feed Feature? What is the Media Center RSS Feed’s primary function and what are the steps to accomplish it? The main function of the Media Center RSS Feed feature is to bring in content from an RSS feed into your app. Before you use the Media Center RSS Feed feature, you will need to have an RSS feed set up for your blog, website, or podcast channel. If you don’t have an RSS feed set up yet, you can always use our Media Center Manual feature to bring your media content into your app. Next we’ll go over how to set up the Media Center RSS Feed feature. You will want to run your feed through a validator such as https://validator.w3.org/feed/ to ensure it’s valid. If you don’t have a valid feed then chances are there are issues with it and you’ll need to address them first before you can begin using the Media Center RSS Feed feature. Step 2: Enter your feed into the RSS URL field and click "Submit"
Once you have validated your RSS feed, grad its URL and put it into the “RSS URL” field of the Media Center RSS Feed feature and click “Submit”. Your feed’s content should automatically show up within the app. 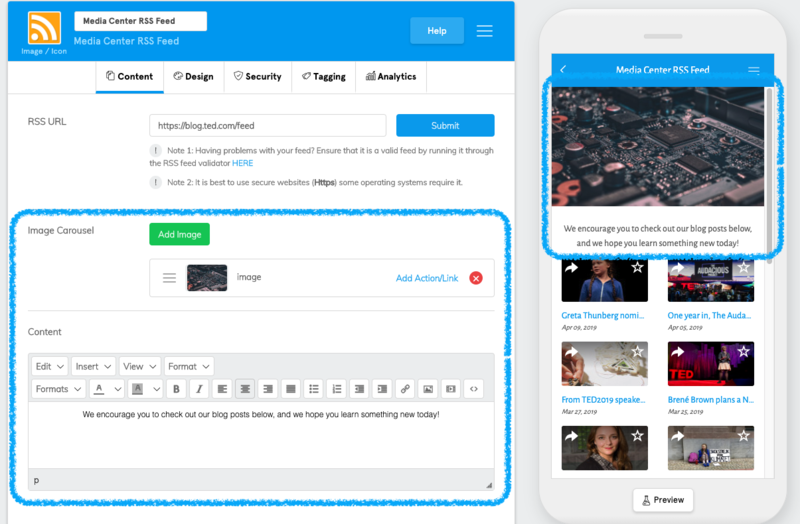 If you would like to include images or text above your feed’s content you can do so with the Image Carousel and Text WYSIWYG Editor. Try using the Folder Feature to include media items if they are specific to a person or topic. For example, if you have a list of three different blogs, you can create multiple media center rss feed features within a Folder feature to categorize them accordingly. Even if you have an RSS feed, you may want to have more customization options with your media posts, then we encourage you to check out the Media Center Manual Feature.